Recently Generations at Neighbors had special guests Lucky and Gracie from Unity Hospice of Western Illinois Paws for Patients. 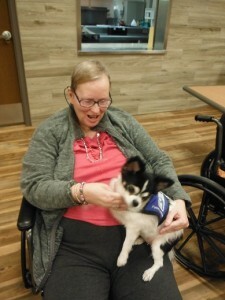 It is an animal assisted pet therapy program that provides unique emotional support for patients and residents. Pet therapy is a growing field and research has shown how beneficial it can be to the elderly, especially those who are living in a nursing home or skilled rehabilitation facility. Regular visits with pets, usually dogs, can have positive physical, emotional, and mental benefits. Just 15 minutes bonding with an animal sets off a chemical chain reaction in the brain, lowering levels of the fight-or-flight hormone cortisol and increasing production of the feel-good hormone serotonin. The result: heart rate, blood pressure and stress levels immediately drop. Over the long term, pet and human interactions can lower cholesterol levels, fight depression and may even help protect against heart disease and stroke. On their recent visit- residents gathered to interact, have fun and pet Lucky and Gracie. Their visit also helps residents stay engaged with the world and adds as a link to more socialization with others. Throughout the month we also have our administrator’s companion Buddy in the facility to walk around and interact with the residents. These special guests are a part of the Neighbors family and are always welcomed with open arms. Our residents look forward to their favorite four legged friends and always give positive feedback regarding the visits.